American Street by Ibi Zoboi deserves a whole lot more attention than I have seen it get. Believe you me, we can actually read MULTIPLE books by Black women authors in a single season. Like, if you enjoyed The Hate U Give and Allegedly but maybe want something that is lyrical, you need to read THIS BOOK. Yes, this book in all caps because I just cannot speak highly enough of it. Ibi Zoboi’s book follows a girl named Fabiola. She is immigrating from Haiti with her mother to Detroit to live with her aunt and three cousins. Unfortunately, Fabiola’s mother does not make it beyond the immigration center. It seems she is suspected of trying immigrate illegally, whereas Fabiola was born in America so technically she is good to go. So, Fabiola goes alone to live with her aunt and cousins. It is quite a culture shock. Fabiola’s three cousins, Chantal, Pri and Donna basically run things at their school. They are tough and no one messes with them. Donna is running around with this guy who is bad news, FYI. And that guy’s friend becomes interested in Fabiola. Meanwhile, Fabiola turns to her religion to get her through her separation and to help guide her. And so, this is a story about Fabiola’s experiences in America and how she retains her Hatian identity while also taking in American culture. As you read American Street I think that you may come to the same conclusion that I did, to know Fabiola is to love Fabiola. For real, she’s a great character. She’s absolutely loyal to her mother, her aunt, and her cousins. Although she does make a questionable decision in regards to her loyalty. She is also very smart. I loved the scenes where she is at school and studying. Also, Fabiola is brave too as you’ll see with regards to the romantic subplot which also involves the bad guy of the book. So probably one of the more interesting elements that Zoboi has included in this book is Vodou. I haven’t read a ton of books that talk about Vodou with any seriousness. I am glad that this book includes that because I like to learn new things. In this, we see many of the people that Fabiola knows taking on roles of deities from Vodou. There’s a man who lives on her street who sings that she sees as a representation of Papa Legba. Then there’s other people who inspire her and at points she takes courage from these icons. It is fantastically woven into the story as well. 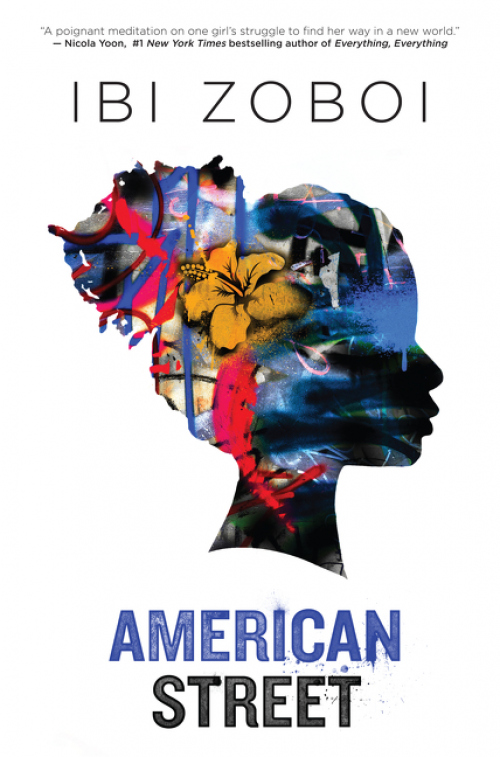 American Street is a gorgeously written book that you need to add to your TBR stack immediately. I think that you are missing out if you do not read it. Zoboi’s writing is artful and she brings together a perfect blend of characterization, setting, and plotting. This is one story that should hit best seller lists, it is very, very good. This book sounds GREAT. I definitely want to look for it at the library. Wow! Five “starred” reviews, and this is the first I’ve heard of this book. Thanks so much!